Social justice is a contentious topic among Christians these days. A large reason for that is that the term has many and varied definitions. While the term was originally used to discuss ensuring actual justice within society, it has come to be interpreted as a means to privilege some ideological groups over others, to justify inherently unjust economic systems, and to excuse violence for certain, approved causes. The corruption of the term has led it to be a polarizing phrase between theological stripes of Christians. Progressives who claim faith in Christ recoil when conservatives attempt to use the term to describe their efforts. Sometimes the affirmation of “social justice” leads Progressives to advocate for causes that undermine true justice. Those on the right often repudiate the term, even when the term is meant appropriately. Often the negative reaction to the term “social justice” leads conservatives to reject important works that are biblically warranted. 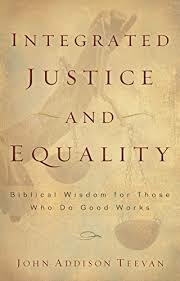 In his book, Integrated Justice and Equality: Biblical Wisdom for Those Who Do Good Works, John Addison Teevan sets out “to encourage the good works of compassion that Christians want to do to make the gospel while differentiating between good works and social justice.” He notes that in order to do that, he must begin by disambiguating his terms. Throughout the text, Teevan is arguing for what he calls integrated justice, which is justice built on a traditional, biblical understanding of justice. In Chapter One, Teevan argues toward a biblical notion of justice, which is often significantly different than many perceive. Through historical argument, Teeven establishes his position that social justice is a term that originated outside of the church by those who found the work of the social gospel attractive, but liked even the traces of gospel that were left in the movement. He surveys the recent historical discussion, interacting critically with contemporary, conservative Christians. Chapter Two provides a survey in greater detail of understandings of justice, especially in those traditions that have impacted Western culture. In the third chapter, Teevan outlines the historical evolution of social justice, which he argues is largely rooted in Rawl’s understanding of politics. He also develops his critiques of social justice with the notion of a biblical, integrated justice. These two chapters provide the foundation for the rest of the volume. The remaining three chapters offer critiques of social justice, arguing it tends to undermine true justice, and bring the book to a close. In Chapter Four, Teevan critiques the notion that economic inequality is inherently unjust through practical examples of perfectly just inequality and the problems associated with attempts to create equal outcomes. The fifth chapter argues against redistributive economic systems designed for “fairness,” which often do not accomplish their stated goals. At the same time, Teevan is critical of capitalism, because he recognizes the limits of the economic system. All economic systems rely upon the virtue of the people. The final chapter brings together the concepts of the earlier chapters to outline specific warnings, conclusions, and practical applications for the reader. What he produces is a call to activism, but an activism grounded and controlled by the norms of Scripture and a traditional understanding of justice. This is a volume much more likely to convince the uncertain that to lead to converts. Those longing for a better society but who are repulsed by the gross depravity of much of the social justice movement will find an outlet to pursue true justice in this volume. At the same time, Teevan appears to concede the term social justice too quickly. Notably absent from his volume is a discussion of the development of the early Roman Catholic use of the term social justice, which was much more biblical than present parlance. It may be possible yet to redeem the term and turn it to good use. Overall, this is a much needed, accessible volume that is both biblically informed and economically accurate. Teevan provides a helpful critique of the social justice and gives a sound justification for his newly coined term. His critiques are honest and forthright. He does not demean, mock, or dismiss, which make this book a useful resource for the church. Additionally, Teevan moves beyond his critique into encouraging practical application, which is necessary to move conservative Christians from theory to action. For the Life of The World: Letters to the Exiles is a recent video series produced by the Acton Institute. The purpose of the series is to help Christians answer the question: “What is our salvation actually for?" This is a question that is vitally important as Christians consider how to engage the culture in an increasing post-Christian world. The production is comprised of seven distinct episodes, which could be watched in close succession like a feature film or in distinct units as part of a study. Each episode is in the neighborhood of twenty minutes, with a total runtime of about two hours. The episodes pick up distinct pieces of the answer to the central question of why Christians remain on the earth after being saved.